A portfolio is a useful marketing tool to showcase your works or products as well as to convince your clients or customers to avail your services and purchase your items. In this modern world with a rapidly advancing technology, portfolios have widened its reach through the power of the Internet. As most people have access to the World Wide Web nowadays, online portfolios do not only expand a business or an organization’s clientele but also provide creative individuals and freelancers a medium to display their talents and gain a following of potential clients and collaborators, giving everyone great opportunities to further establish their endeavors and eventually gain success, whatever field you may be in. However, you will not be able to achieve these things if you do not have an exceptional portfolio website to start with. 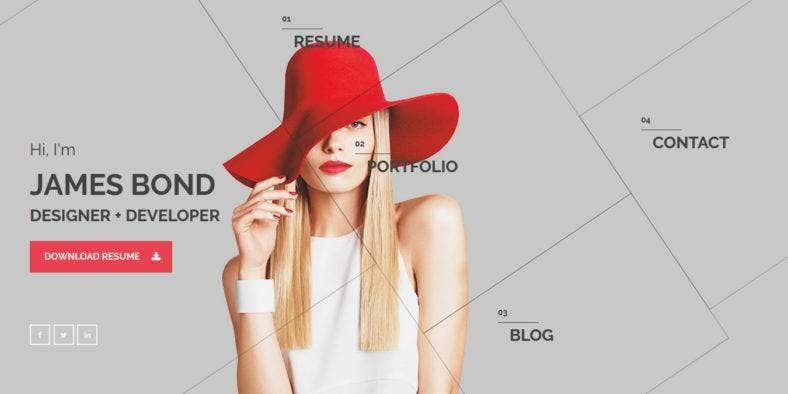 A portfolio website template that is incorporated with the latest Web design trends and technology standards, as well as one with a state-of-the-art design and powerful functionalities, guarantee the most favorable outcomes. Therefore, whether you’re an artist or a photographer, a designer or developer, an individual or an agency, you are best to go with the unmatched combination of a solid HTML5 Web framework with smooth CSS3 style sheets built on the top-notch Bootstrap platform. 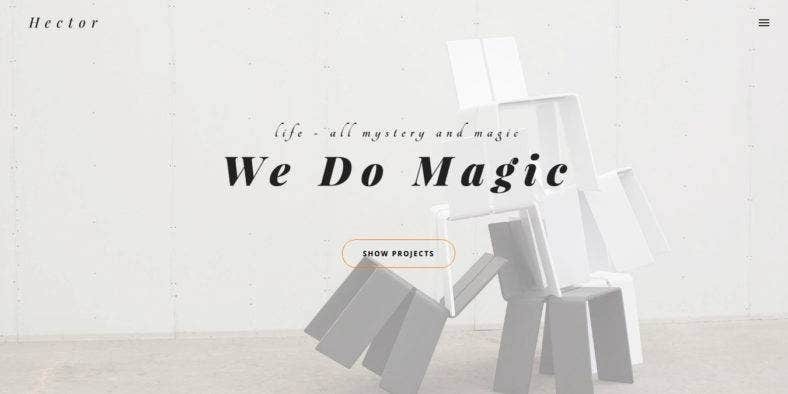 Just like the extensive collection of awesome portfolio website themes and templates you see below, which you can use or find inspiration from. First of all is this multifaceted and versatile portfolio website template made for both personal and business use. 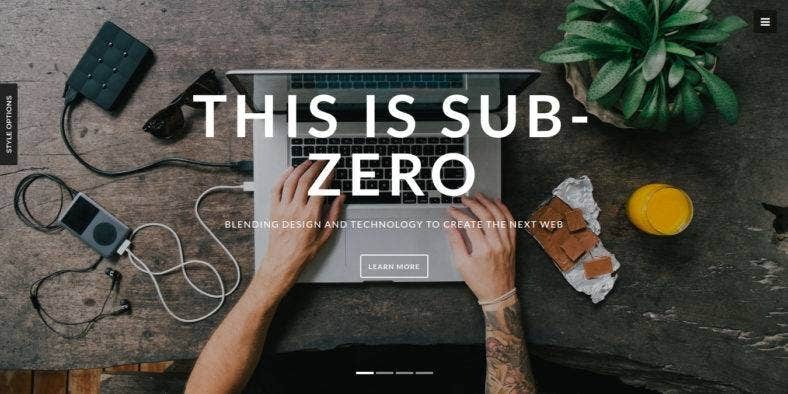 Sub-Zero is characterized with a one-page layout with full-screen and full-width headers, a clean and minimalist design, and easy-to-use navigation among others. With high-resolution imagery and an ample amount of white space, this template allows your content of your amazing works to shine more. The theme’s other features include a responsive design that lets your website adjust to fit different screen sizes and mobile devices, a portfolio gallery that includes the Magnific Popup lightbox gallery to showcase images and videos, a couple of styles to choose for personal or business, multiple pages with templates for single projects, 404 page, and Coming Soon page, Google Fonts and vector icons, and so much more. Second on this list is Modern Vintage, a fresh and modern one-page website template that is perfect for various types of portfolios for graphic artists, Web designers, illustrators, and other kinds of creatives. It consists of seven sections where you can add content for your introduction, information about you or your company, the services you are offering, prices and rates as well as your contact details. It also includes sections with amazing features such as the Projects page with models to showcase details about your portfolio project when you click on a Read More button, and the Latest News page with Flexslider to display your post in an interesting manner. Other features consist of bold images, nice typography, stunning animations, smooth scroll, and a gorgeous Touch gallery for projects. Next is the HTML Bootstrap website theme, Beatrix. 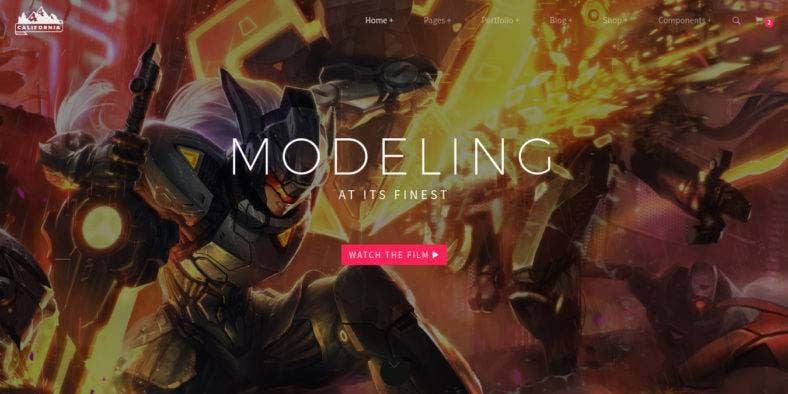 This template is based on solid code and brand new Bootstrap v3.3 and uses modern jQuery and CSS3 techniques to create stunning effects and eye-catching animations to draw your audiences’ attention and keep their interests. It also presents a contemporary one-page layout and fully responsive design that makes your portfolio website clean and professional-looking. 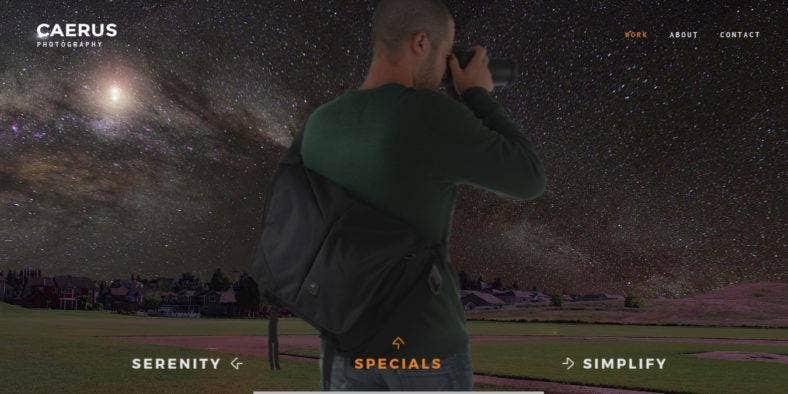 Aside from that, the theme is designed with trendy large image background with high-resolution imagery giving you the means to demonstrate your design or photography skills right at the forefront. Its prominent and easy-to-see social media buttons help you promote your services and reach out to your potential clients. It also includes alternative sections with different content types and elegant modal popups for more content. 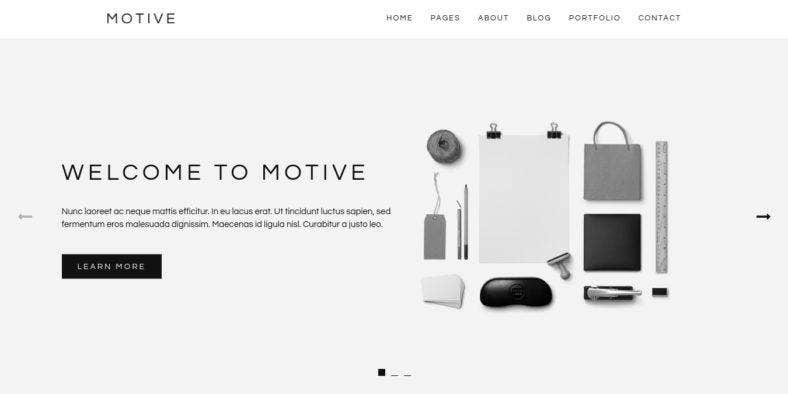 Motive, on the other hand, is a minimal portfolio HTML5 template built for personal and agency websites, with its super clean design and dynamic portfolio section, which includes a fuel filter and detail pages. Made with HTML5 and CSS3 and built on a responsive 12-column grid structure, the theme features lots of customization options along with a full documentation to help you create the perfect website that caters to your needs and suits your taste. Among its other features are the multiple page variations, an Ajax contact form, jQuery filter system, Owl carousel slideshow, Google Web Fonts, and much more. It also includes an about page and blog section that can turn this template into a blog instead of a portfolio. It is fully responsive, so your website is guaranteed to display well on all devices of every screen sizes; and cross-browser compatible, so it works well in any major browser available. A premium portfolio HTML themes, Showcase comes with a dark-themed but gorgeous two-page template for any type of personal portfolio WordPress websites of digital designers, Web developers, photographers, and other creatives who want to present their works in a beautiful way. With a clean design and a fully responsive layout, it is easy to catch your viewer’s attention and reach a wide spectrum of potential visitors with this template. Based on the Bootstrap framework, it presents a flexible and well-commented HTML5 and CSS3 code optimized to provide its users extreme customization capabilities, and we design functionalities. Other features include a grid of projects and a projects page with lightbox images, a testimonial carousel, a working contact form, Google Fonts, and an extensive documentation available to guide you in building your website. 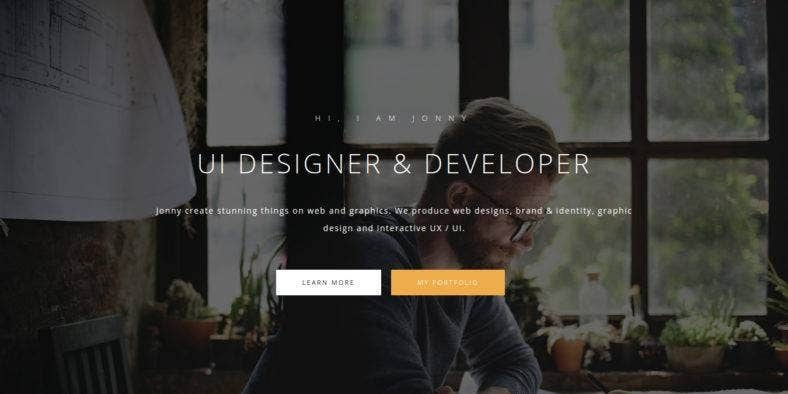 The next HTML portfolio template featured on this list is Jonny, a minimalist personal website theme built especially for Web developers, designers, artist, and other freelancers who need a great website to introduce themselves and show off their best works. It has a simple, clean, and modern design that helps highlight your products and put more focus on your content. It is also easy to customize, so you can personalize your website conveniently. Being built with the latest version of the Bootstrap framework, this template boasts of a fully responsive design, which makes it adaptable to different types of desktop and mobile devices of various screen sizes. It also features fabulous typography that consists of Google Fonts and Font Awesome icons, along with jQuery effects and animations and high-resolution imagery in order to boost your website’s visual appeal. 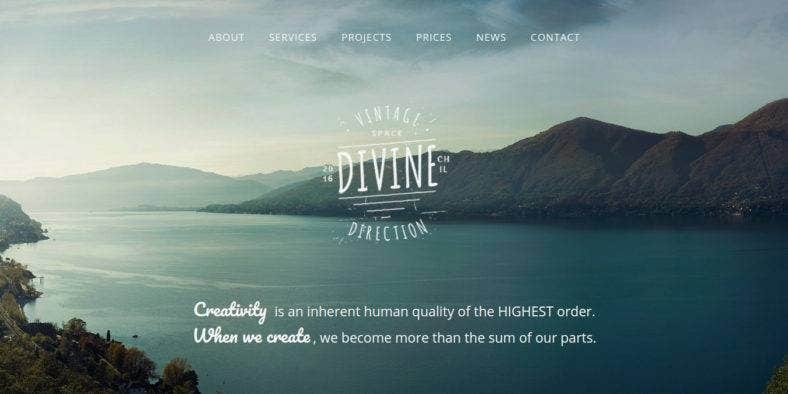 This creative one-page website theme you see above is made with the latest HTML5 and CSS3 standards which make it packed with awesome features and functionalities. White, as its name implies, comes with a simple yet dynamic design characterized by gorgeous high-resolution images, stunning typography, an abundance of white space to display your content. It’s high-quality and unique design sure meets all requirements of a trendy one. Other than the one being mentioned, the template also boasts of a fully responsive layout that allows your website to display beautifully across devices, as well as a clean code that results in an easily customizable design that lets you replace images, texts, and other elements according to your needs and preference. It is inarguable that this robust template is perfect for personal portfolios, creative agency and studio websites, and others. Then, we have Master, a responsive portfolio website theme with a clean and creative design perfect for online personal resumes, CVs, and cool portfolio websites. Based on the Bootstrap 1170px grid system, the theme comes with a bunch of awesome features that are easily customizable thanks to its clearly-organized and well-structured code. Anyone can use this template, whether you’re a designer, freelance, or marketer. Aside from its very clean, elegant, and modern design enhanced with an exquisite set of typography comprised of impressive Google Fonts and unlimited Font Awesome icons, this template also features a fully responsive, retina-ready, and cross-browser compatibility making it adaptable to different screen sizes and various aspect ratios, all kinds of devices whether desktop or mobile, and many types of major browsers. 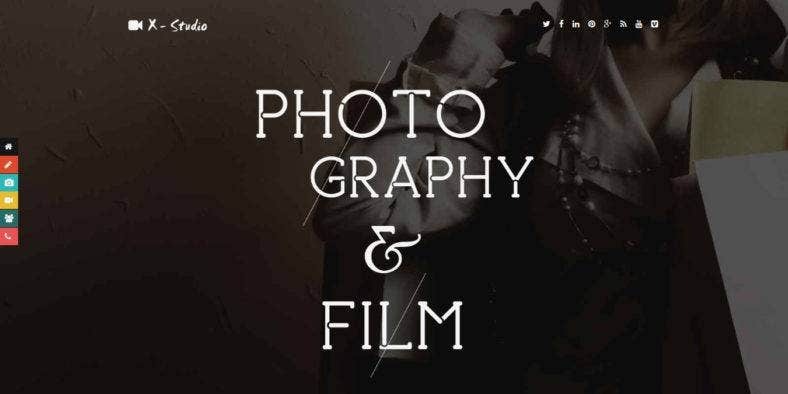 Next is Light Photography, a simple and clean portfolio website theme for photography with a modern and professional website design perfect for both professional and amateur photographers who are just starting out. It has a basic layout and minimal design, along with well-organized and documented files that make the theme easy to set up and customize, even with users who have zero knowledge in Web design and development. Built using standard Web technologies such as HTML5, CSS3, JS, and jQuery on the latest Bootstrap framework, this theme comes with a number of cool and modern features like its fully responsive layout, high-quality imagery and color scheme, stunning effects and animations, page scroll, custom fonts, and so much more. It is also cross-browser compatible, so you’re assured it works great on all major browsers. 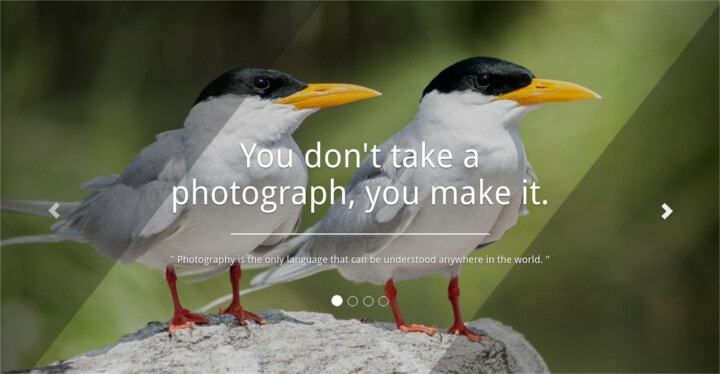 Ark Photography, on the contrary, is a colorful and image-based website theme for different kinds of photography. This creative single-page HTML template developed in Bootstrap and works well with its latest version can be used for personal portfolio websites, creative agency, and studio website themes, designer portfolios, photography website themes, and more. With two versions available, you can choose between light and dark concepts. It also presents a couple of styles to choose from where you can have a plain layout background or an abstract one, with a simple or animated layout. With these options, you get 8 sample layout options. It also comes with other features such as a fully responsive design for smooth adjustments on any device, an image slider to highlight your best works, a burger menu for easy navigation, a dazzling parallax effect, and elegant typography. 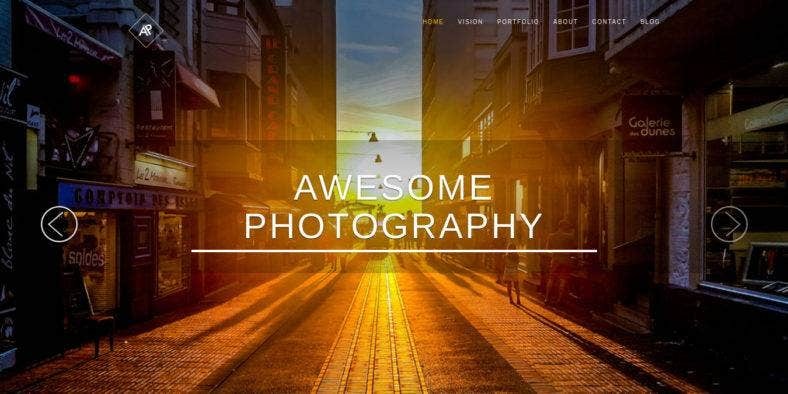 A clean photography website template with a purpose to simplify your viewer’s photography website experience, Siena offers a clean and gorgeous photography theme for your website that enables you to highlight your beautiful photographs and impressive works very well. This multi-concept website template is purposely built to cater portfolio website variations with both attractive visuals and useful functionalities. 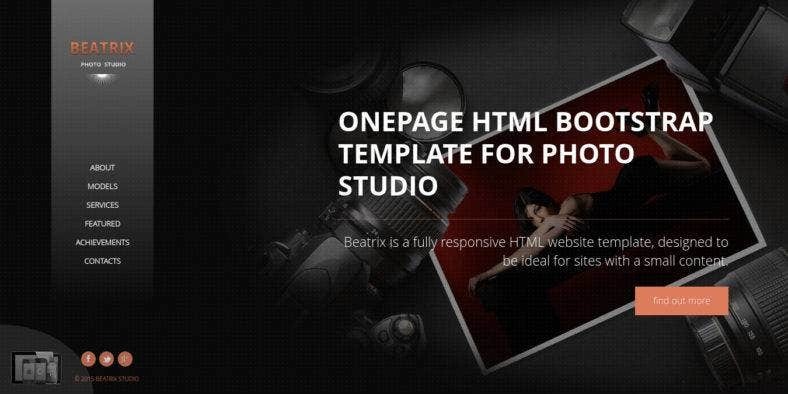 With a variety of page templates and concepts included in this template’s package, you can increase your exposure to the photography world with this template as it comes with some amazing features that you and your audience will surely love. Among these features is the ability to use multiple images and video contents, customize the colors and background overlay as well as every title, text, and button on the template to fit your style. 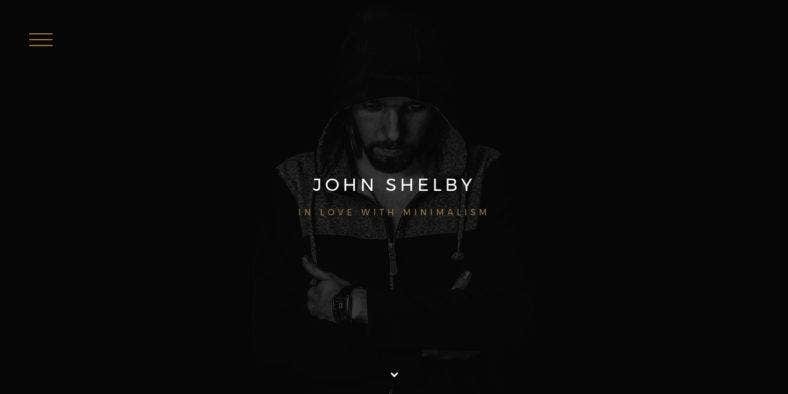 Another one-page portfolio website theme on this list is Shelby, a clean and elegant HTML5 template with minimalist design and a fully responsive layout that screams modern and state of the art. 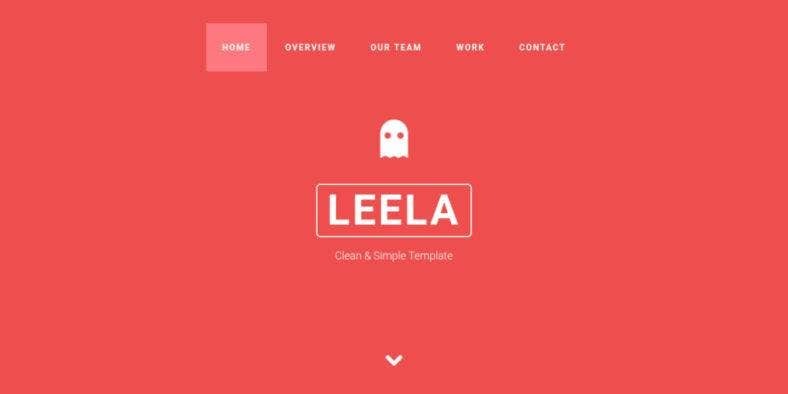 With a dark header and a layout that is characterized by an abundance of white space, this template is perfect for personal freelancers like individual graphic artists, Web designers, illustrators, artists, and other creatives. Included in its wide array of features is the well-structured HTML5 and CSS3 code for effortless customization, a large set of Google Web Fonts and Font Awesome icons for a stunning typography, smooth and parallax scroll with CSS3 animations for a gorgeous visual appeal, and many others. Its latest versions include a new menu design, a darker portfolio and footer background, a fixed background parallax effect, an image and video project preview, etc. 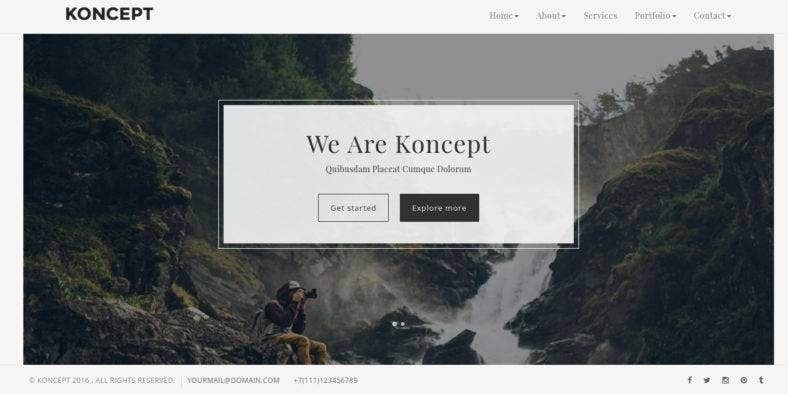 The portfolio and photography website theme above is the creative and multipurpose template, Koncept. As its given moniker tells us, this theme can be used for different portfolio concepts and by various types of websites such as portfolio, blog, and other personal website themes. 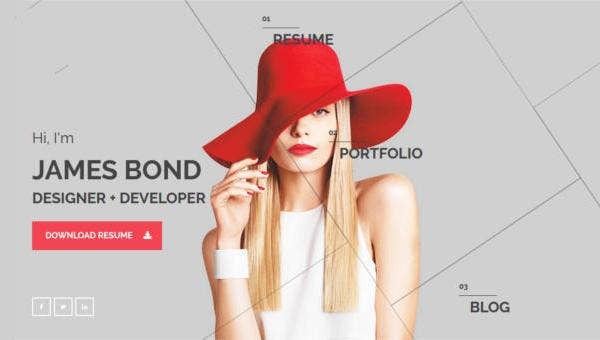 It can also be used by creative agencies, design studios as well as freelancers, with its high-quality and unique style built with a valid HTML5 and CSS3 code. It comes with various layout options. specifically for personal resumes and one for each multipurpose and one-page designs. Based on the latest Bootstrap version, it has a fully responsive layout with one-page and multi-page options. It also has a minimal design in a boxed mode with a lightbox gallery and multiple portfolio options. Other features include a cross-browser optimization, a working PHP contact form, and so much more. This responsive Bootstrap portfolio template based on Bootstrap 3 and developed using HTML5 and CSS3 standards offers a one-page responsive portfolio Web design theme that suits well with any personal and business portfolio websites. 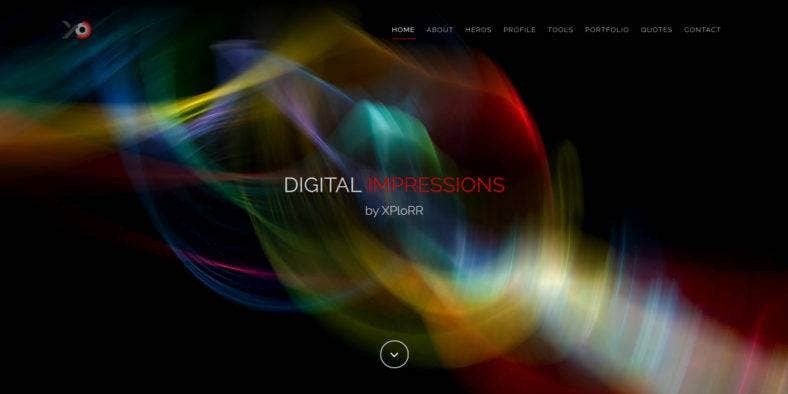 XploRR is a dynamic website theme that is packed with powerful features that make this great Web design tool perfect to use for both professional Web developers and amateur website owners. It features the latest Web design trends such as the video, photo, and audio content support, auto-scrolling and parallax effect, mobile menu button collapsing effect, mobile-friendly and Touch-enabled design, smooth carousel and dynamic LightBox, Izotope gallery, optional Addon pages, social icons, and more. This portfolio template also includes HTML, CSS, and JS code comments for quick installation and easy customization. Then, here is Leela. It is a one-page HTML website template with a clean and minimal design that is just right for your personal website templates and portfolios. Unlike most of the website themes on this list, this template is built with Zurb’s Foundation 5 framework but still works seamlessly like the others. It also features a responsive layout and includes tons of attributes just like that of a Bootstrap-based template. These attributes include a one-page navigation with expanding projects area, different colors available for each section of the website, a gorgeous image slider, a wide choice of Font Awesome icons and Google Fonts, a customizable Google map, a working Ajax form, and a lot more. It also includes a well-documented code to help and guide you upon installation of this theme as well as free support from its developers for questions. Going back to Bootstrap, here is another responsive portfolio template built with the most recent version of the popular framework, Bootstrap 3.3.2. X-Studio is a bold and dynamic portfolio theme developed with providing your photography and film products an awesome online residence for your clients and viewers to see anytime and anywhere. With a fully responsive feature, it allows your works to be displayed beautifully on all devices. The theme comes with over 5 various pages with a bit different design approach as it features a large background image slideshow that can be used to showcase your favorite images or videos, making this website template perfectly suitable for media professionals. Furthermore, the theme also includes other cool features such as an Ajax PHP contact form and portfolio filters that help you make a cohesive portfolio and so much more. 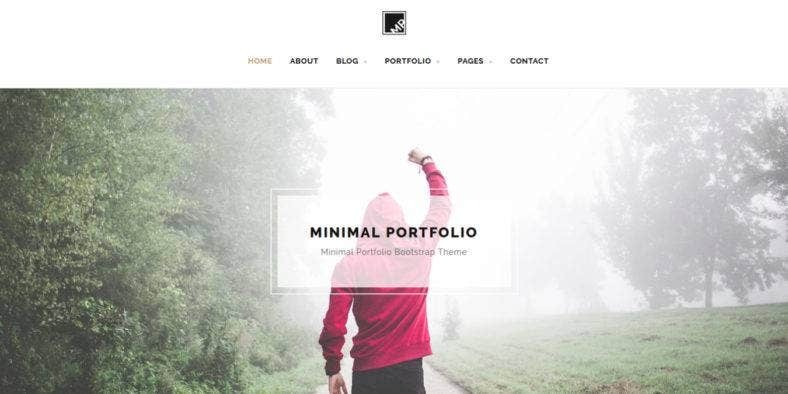 Just like how this template is called, Minimal Portfolio presents a clean and minimal design that is elegant and professional on Bootstrap-based website theme. Built using SASS, HTML5, and CSS3 technologies, this beautiful and equally functional template is very easy to set up and customize, with the help of its well-commented code, well-documented file structure, and 24-7 professional and super fast support from its developers. Fully responsive and retina-ready, your portfolio website theme is guaranteed to still look great no matter what device it is viewed on. Being developed on the latest Bootstrap 3.3.7 version, this theme includes 12+ homepage demos, 30+ HTML files, and over a hundred components that you can customize easily. It also features a working contact form with validation, Google Maps integration, Google Fonts, Font Awesome icons, linear icons, and more. California is an all-in-one HTML5 website theme with over 140 HTML pages that includes 6 demo pages, 6 landing page examples, 30+ built-in intro variations, 25+ portfolio variations, 10 pre-made color schemes, and 50+ section blocks to build any type of website. With this extensive list of components and elements, this theme is developed with a mobile-first concept to run smoothly on handheld devices and then scaled for desktop devices. This high-quality multipurpose HTML5 template is made 100% responsive as it is based on the Bootstrap framework and designed with HTML5, CSS3, SASS, and jQuery technologies. 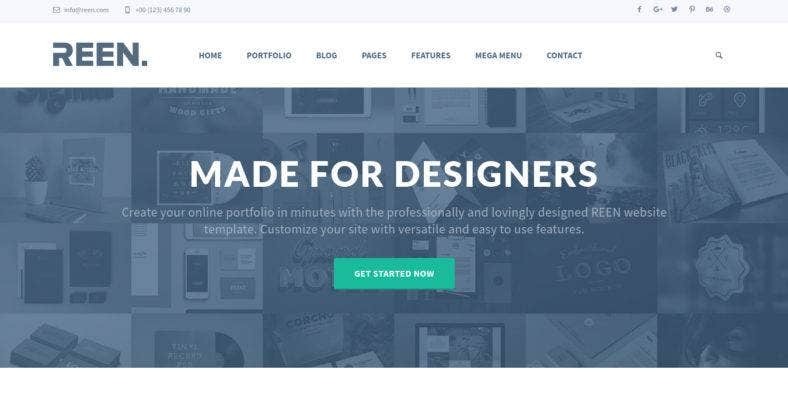 Along with its many features, which include custom graphics, full-RTL support, and more, this theme allows you to build a unique and attractive website for your personal portfolio and blog, creative businesses, start-up initiatives, or eCommerce websites. 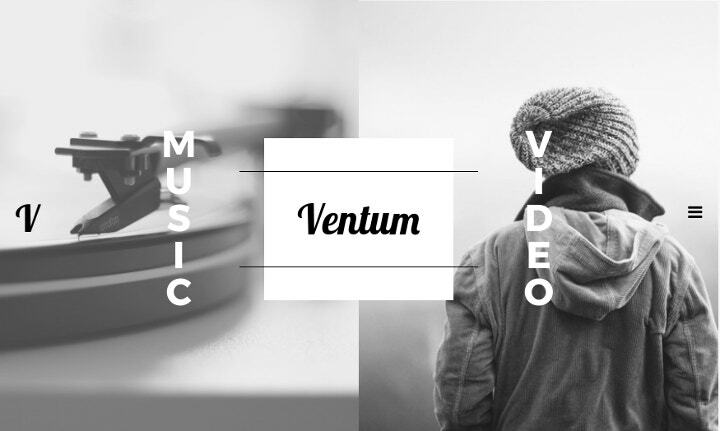 A creative portfolio template, Ventum is a responsive HTML5/CSS3 template for portfolio, agency, business, and freelancer websites. It comes with a clean and professional design with modern features that can be used for many types of websites, landing page themes, and other Web pages. All the HTML files included in this theme consist of well-organized components making it easy to modify and customize its elements. Moreover, the theme comes with two versions allowing you to choose between the one-page and multi-page versions. Built with Bootstrap and coded with HTML5 and CSS3, it also boasts of a highly responsive layout that allows your website to adapt well on various mobile and desktop devices with different screen sizes and aspect ratios. It is also compatible with most major browsers such as Google Chrome, Android, iOS Safari, Firefox, etc. 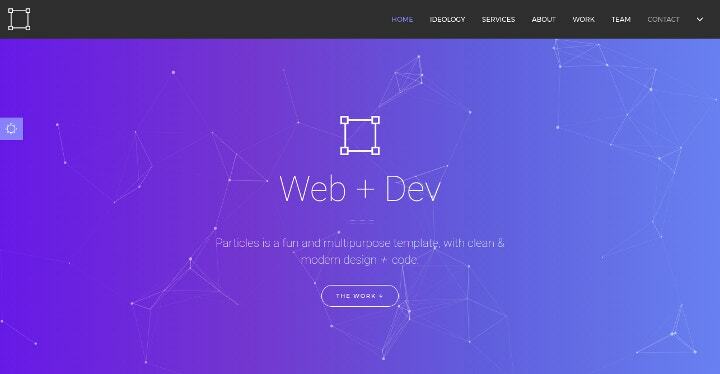 Another unique and creative website theme for portfolios and basic personal websites is Particles. This theme boasts of a different look and feel thanks to its vibrant solid color background with animated effects that will surely catch the attention of viewers and keep their interest. Moreover, these features can be modified according to your preference with the help of 2 base colors (light and dark) as well as 8 color options where you can add your own easily. Aside from the ones mentioned, this template also includes other cool features such as 5 portfolio grid options with a flexible and filterable portfolio, a Slider Revolution, a working PHP contact form, easy parallax backgrounds, multiple pages available, 3 pricing table options, 3 footer options, and 2 team options among others. Built with Bootstrap 3, the theme is highly responsive with W3C valid HTML5 and CSS3 code for easy customization and use. Then, we have Pasadena. 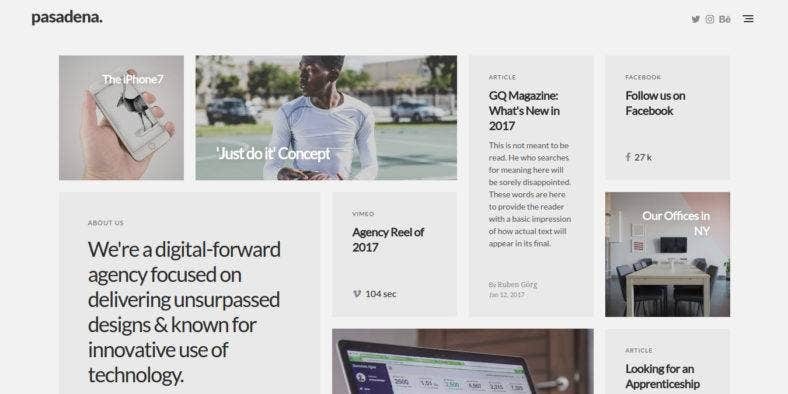 A modern and unique HTML portfolio theme with a tiled grid system layout over a white background that gives your website a minimal and professional look. Based on Twitter Bootstrap with valid HTML5 and CSS3 pages, this portfolio template is perfectly responsive so it displays and works well on all devices as well as retina-ready as it is optimized for mobile touch and swipe. That is why its wide array of features include Ajax-loaded details with larger images and hundreds of retina-ready icons, which add dynamics to the content of your website. It also comes with a working Ajax contact form with validation and a working PHP mailer script. These features will help you generate leads and keep in touch with your visitors. In addition, this template is compatible with all major browsers. 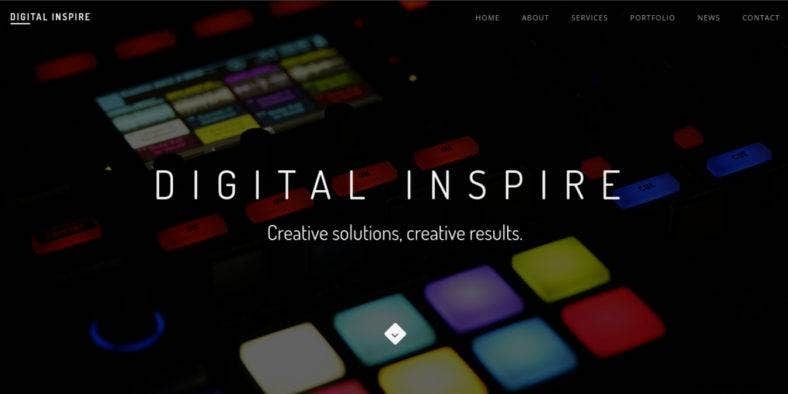 Next is a multipurpose website and creative landing page template, Digital Inspire. A clean and modern responsive HTML theme that is suitable for any freelancer, business or corporate website templates, portfolios, blog, and other creative Web portals. It boasts of a creative and state-of-the-art flat design that provides you with lots of customization possibilities, so you can build just the right website or landing page that you need. 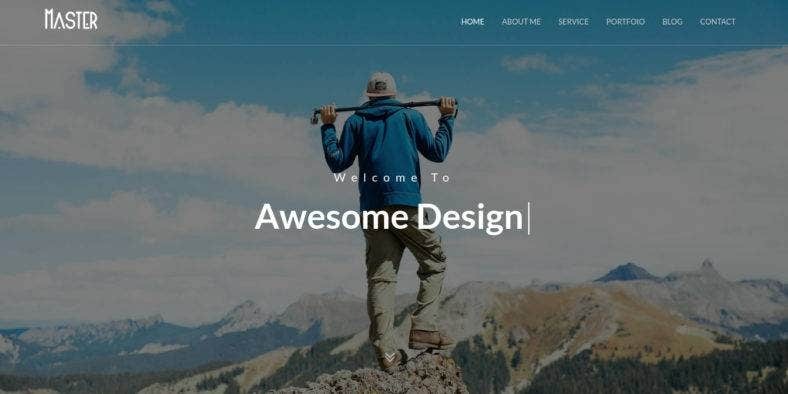 Developed using the latest version of the Bootstrap framework, this one-page template features a fully responsive layout with enhanced user experience and usability, thanks to its many options included in the theme such as the latest collection of Google Web Fonts and Font Awesome Icons. Just like any Bootstrap-based website themes, this template is also compatible with all major browsers like Firefox, Safari, Chrome, etc. 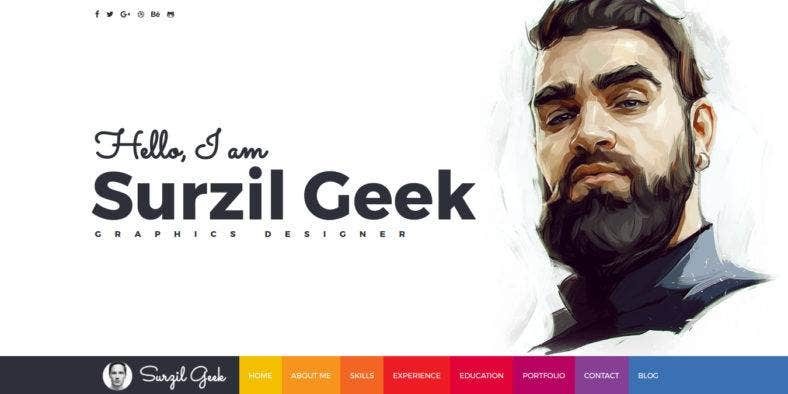 The illustrated and colorful website theme you see above is Geek, a neat and trendy personal resume and portfolio template developed with HTML5 and CSS3 and based on the latest Bootstrap 3.3.7 version. It has quite a unique design that is topped with an awesome header where you can introduce yourself in any creative way you want. And, your multiple Web pages are assigned with different bright colors in the main menu. These features are perfect for highly creative individuals such as graphic designers, Web developers, illustrators, artists, and more. It’s simple and clean layout allows your content to shine in the best way possible as it provides a generous amount of white space to direct the eyes of your audience toward your work. Also, this theme includes a number of homepage variations, CSS3 animations and transitions, Google Fonts, and Font Awesome icons. 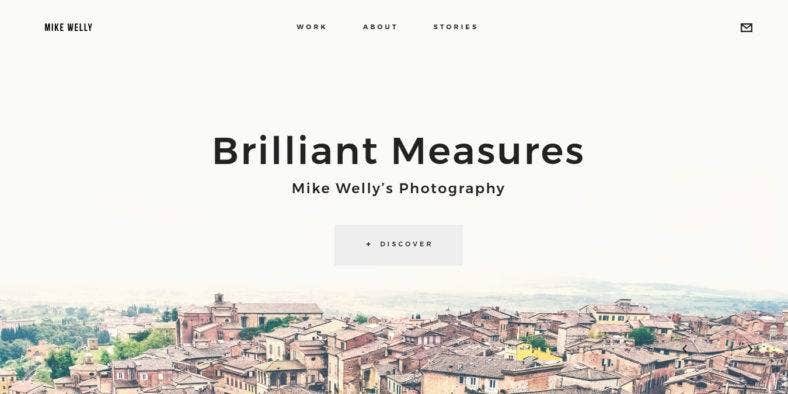 This one-of-a-kind and creative portfolio theme are specially made for photographers, media freelancers, video producers, filmmakers, and more. Caerus is a complete and versatile HTML template that enables you to present your collection of works, inspiration, products, or services in a way that no one has ever seen before. It has a unique kind of navigation that is easy to use and totally interesting, which you and your audience will surely love. A minimal photography website theme and gallery template are guaranteed to have every detail you need to be covered as it includes features such as a Photo Stacks slider, intense Image Zoom, CSS3 animations, parallax effects, and a responsive layout among others. It also includes an unlimited number of colors, so you can create your own custom color scheme immediately as well as an entire collection of Font Awesome and Ionicons Font icons. 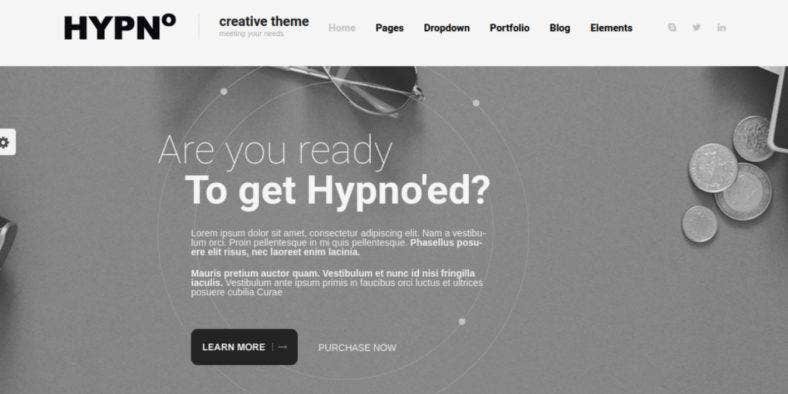 Hypno, on the other hand, is a multipurpose HTML5 template with a fresh and modern design as well as a dynamic and functional layout that will definitely make your website stand out. It comes with 42 HTML pages, which includes pre-built content, blog pages, portfolio gallery, section shortcodes, and much more. It also features a Mega Menu for easier navigation, CSS animations for a better visual appeal, and Font Awesome icons for gorgeous typography. Up-to-date with the latest Bootstrap framework, this theme also consists of a fully W3C valid code that is clean and easy to expand, pre-compiled CSS and fewer files, and a detailed documentation to help you build and customize your website no matter your level of experience. For more options on how to display your works and content, the theme also includes 5 posts types, 3 portfolio types, and an Ajax-based portfolio. Made for designers, Reen is a beautiful, clean, and responsive website theme that provides a high-quality solution to anyone who’s looking to build the perfect website for his or her business, portfolio, and others. This creative Bootstrap 3 portfolio template is characterized by flat UI design on a fully responsive layout, with 10 pre-styled backgrounds and 8 pre-styled template color schemes to choose from. Other features include 50 HTML pages available for use with 5 homepage layouts, on-scroll header resize, a Mega Menu, a professional blog layout with a masonry grid layout option, touch-and-drag–enabled sliders and carousels, models, tabs, accordions and toggle boxes, audio and video embedding, Google Fonts and Font icons, clean UI animation, cross-browser compatibility, and much more. It is easy to use, customize, and maintain. Another unique and state-of-the-art portfolio theme is Hello, which can also be used as an online resume, V-card and personal page template and is also perfect for any personal and agency websites. Made with Bootstrap, it has a modern yet professional-looking design, with an easy navigation and one-page layout that allows you to organize and display your skills and works effectively and effortlessly. Ideal for designers, developers, and freelancers. The next template will definitely not be called Awesome Photography if it is anything but. 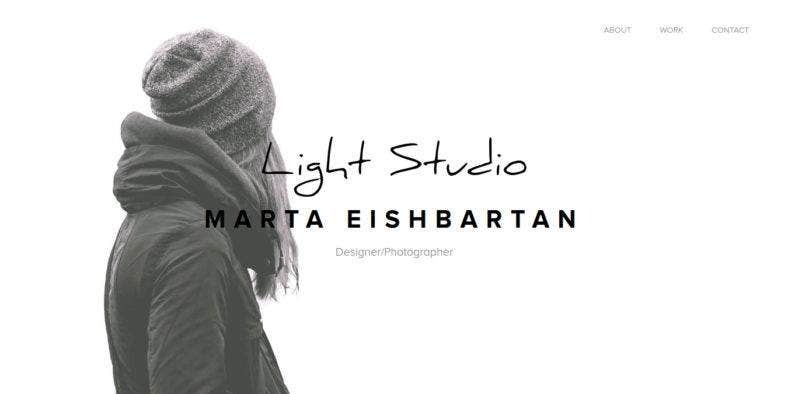 This awesome photography and portfolio template is creatively designed so you can present your works in a professional and beautiful manner. With a striking text slider over a full-screen image background, you will surely be able to draw more visitors and potential clients to your website and generate more traffic and leads or sales. Its main features include an extremely responsive design that allows your website to work well on all devices as well as easy to use and customize elements, which are built with well-documented W3C valid HTML codes as this template is based on the Bootstrap 3.2 template. Other features include a working contact form, Font Awesome icons and social links, Wow content animations, and so much more. This is another creative and minimal portfolio theme that is perfect for all types of portfolio websites, whether you’re a blogger, freelancer, or video producer. Hector is an extensive and very flexible Bootstrap HTML template that comes with tons of unique and cool features as well as many available options for customization. Whether you want to showcase your works or sell your products or services, this template is a great choice for you. Among its many features is its fully responsive and retina-ready layout with gorgeous parallax effects and stunning CSS3 animations, which enhances the look of your website along with an entire collection of Font Awesome and Ionicons Font icons for a top-notch typography. It also includes a Squeezebox and Masonry portfolio layout, a working contact form, and unlimited color options you can use to come up with your own color scheme. Next is a bold and dynamic one-page HTML template that can be used for business websites, landing pages, minimalist blogs, personal Web pages, and more. FlyCreative is a responsive Bootstrap-based website theme that uses modern animations, standard functionalities, and state-of-the-art designs over a contemporary and clean layout. Professionally created, just like the rest of the templates here, it is easy to set up and customize. What is more is its collection of awesome features integrated into the template. These include the valid HTML5 and jQuery codes, LESS files, CS3 animations, Google Fonts support, parallax effects, a stunning gallery, and many others. It also comes with ready-made pages for a home page, blog page with details, image header, and a portfolio page with details among others. For different sections on the Web pages, shortcodes are also included in the theme. 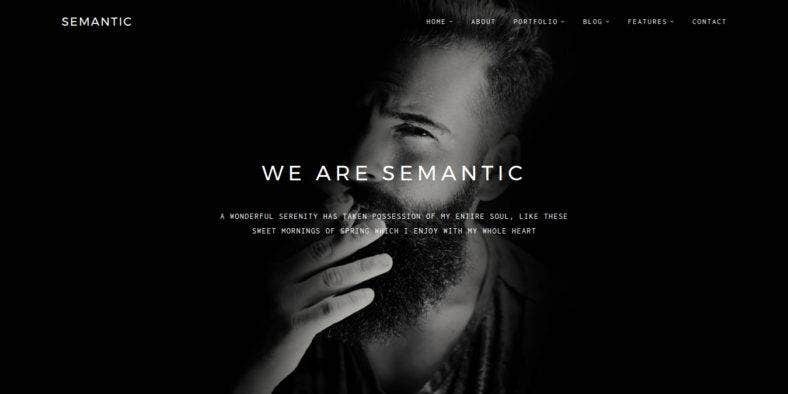 If you’re looking for a minimal and dark-themed Web design template for your portfolio and other personal or business websites, then, Semantic is the template that you have been looking for. This modern and multipurpose portfolio theme comes with 62 HTML pages that contains 8 home page variants, 6 types of portfolio layouts, 2 types of blog layouts, a working contact form, a Contact Us page, and an about Us page among others. Other features include a full-screen image and slider backgrounds with parallax effects as well as a full-screen responsive YouTube video background, ET-line and Font Awesome icons with hundreds of choices for custom typography, a Google map, form validation, striking CSS animations, and so much more. Being built with the Bootstrap 3.3 framework, the theme also boasts of a fully responsive and mobile-ready design. 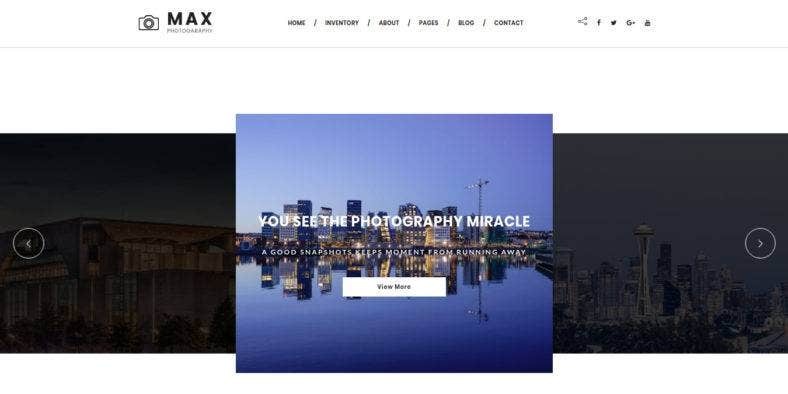 Last, but definitely not the least, is this clean and professional-looking photography HTML template called Max Photography. Based on the latest version of the popular Bootstrap framework, this theme prides itself with its highly responsive design that enables any website built with the template to adapt well on any device of any screen size in which it is viewed on, along with other great features included in the theme. These features are comprised of amazing CSS3 effects and animations that enhance the look of your website, an optimized code so it is simple to use and easy to customize, a working contact form to generate leads easily, an extensive collection of Google Fonts and Font Awesome icons for a gorgeous typography, a filterable portfolio to create a comprehensive display, and a detailed documentation for necessary reference. So there you have it. We, here at Template.net, hope that you were able to find the perfect and best website template for your portfolios, resumes, and free personal websites. We assure you that all these website themes and templates are carefully selected and curated to give you the cream of the crop. Built with the latest and most recent versions of the Bootstrap framework and developed with dynamic HTML and CSS standards along with the best practices of Web design technology, the portfolio themes and templates you see on this list are guaranteed to have outstanding functionalities and the most efficient usability. For more ideas and inspiration, we invite you to take a look and check out our extensive selection of top-class website themes and templates while you are here.